My son turned 8 this week and in preparation for his party (the morning of), I sewed up party bags to hold the favors. They were EASY and if you've sewn a bit you could easily figure them out, but I took a snap shot of the process to share. I used my serger for these but you could just as easily make them up without one. 1. I started with a rectangle about 9"X6" and serged the top. 2. 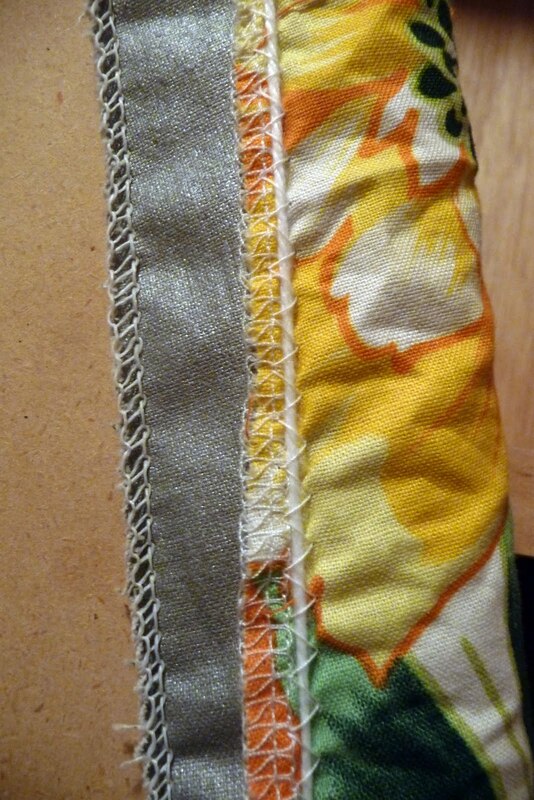 Then I folded it in half and sewed together the other two sides. 3. Next, to form a casing, I folded down the top about an inch and stitched right on top of the serged edge. 4. Then I unpicked the side seam just enough to fit a safety pin through and I threaded a piece of yarn to make a drawstring. Here's a close up of the opening. And that was that!! It took me about an hour to make them. The serger is speedy!!. Okay...that wasn't too exciting so I'll just show you my new ironing board cover. It is bright and cheery and only took me about 20 minutes to do. In case you're curious, this is what it looks like underneath. I just put it right on top of the old decrepit one. How?...I just laid the fabric right on top of the board and cut it about 3 inches bigger all the way around. Then I serged the edge, and had I been smart I would have added the string right into the serging but I didn't take the time to figure out how to do that. Instead I used a trick my mom taught me a couple of weeks ago to easily gather fabric. I fed a string under the presser foot of my sewing machine and zig zagged over it with the biggest stitch I could. Then I put it on the board and cinched it tight. The string I used was the same one from the pre-existing cover (some sort of cotton cording). And that was my speed sewing for the week!! Somebody give me some tips for speed blogging!! Love the ironing board cover! (And I LOVE that the ironing board folds up into the wall!) I will need to try that gathering technique sometime. Sorry, no tips for speed blogging! It always takes too long!